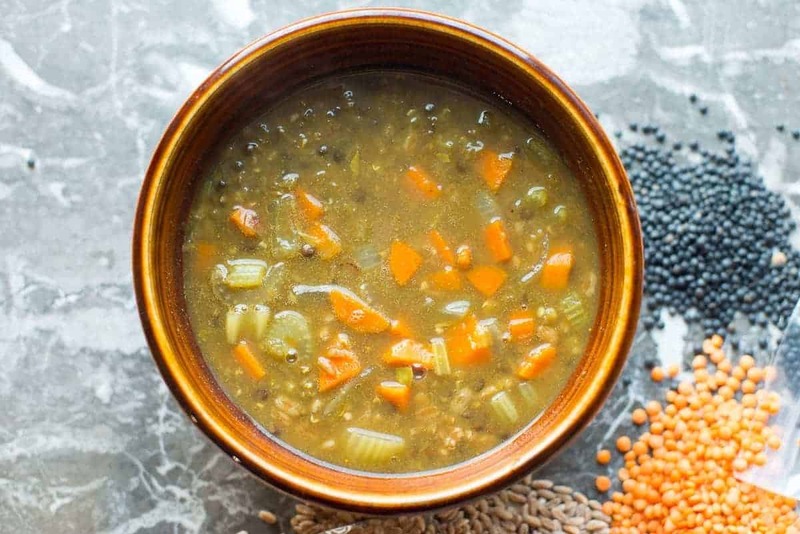 Lentil and Farro Soup - stick to your ribs delicious! Everyone needs a few hearty stew recipes in their cooking repertoire. This is a hearty vegan lentil stew that has stick-to-your-ribs character. …especially when everyone else in the house is omnivorous. I am always looking for recipes that can satisfy both camps. I usually try to cook a recipe that I can either adapt to be vegan or a vegan recipe that I can adapt to be more carnivorous. This hearty lentil and faro stew is ‘meaty’ enough to satisfy everyone in my house. 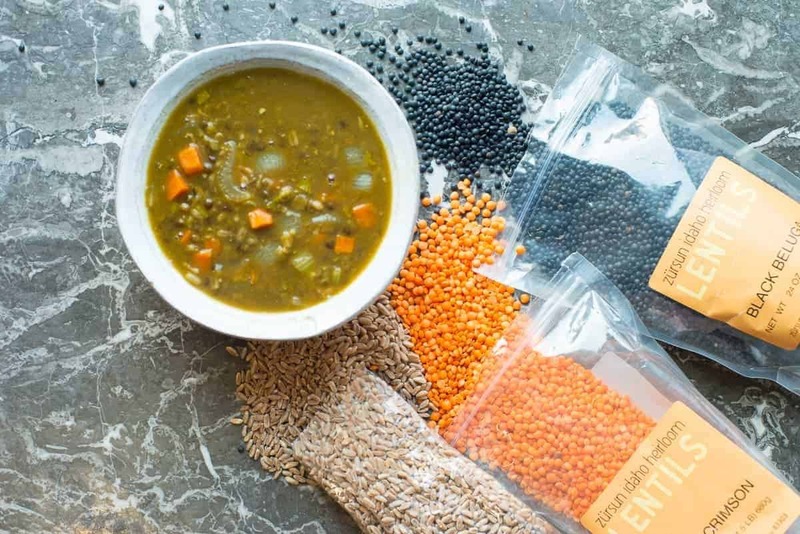 I use two different types of lentils, red lentils and black beluga lentils and also farro – which is a hearty ancient grain. The farro gives this stew a wonderful texture. I also like using the farro because, unlike rice, it holds up to being reheated as leftovers. Rice always gets mushy after you’ve left in the fridge for a few days. Farro does not. This stew also has a curry flavor that is warming and comforting. I think you will agree that this stew is a true crowd pleaser for everyone in your house. Usually I suggest a vegan substitution, but for this recipe I will suggest a carnivorous one. Adding about a pound of chopped chicken or ground lamb makes this dish truly carnivore friendly. You can also boost the nutrition by adding kale or spinach – for a nice serving of dark greens. Don’t forget to sign up for our insiders club and get freebies delivered to your inbox. Get our Top 5 Master Spice Mix Recipes right now! A rich hearty vegan stew that will warm your belly when the weather is cold. Heat coconut oil in a large soup pot. Add stock, water and the spices. Bring everything to a boil and then reduce to a simmer. Simmer for about 20 minutes or until farro is tender. Carnivore Adaptation: Add about a pound of your choice of meat. Brown along with onions and garlic. Add more water if you would like the soup less thick.